My mid 2014 13" macbook pro (retina) has been acting really weird. Two days ago, after I powered it up, the mouse started going crazy, moving all over the place, and eventually stopped moving, and my trackpad hasn't worked ever since. I'm using an USB mouse which works flawlessly. My keyboard is also strange ever since, often not registering my key presses. 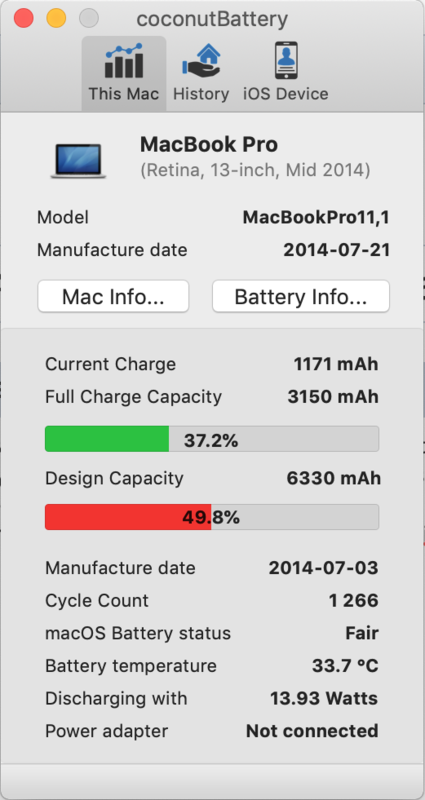 After searching several forums, I found some users who reported this happening when their battery started swelling, but my trackpad still clicks fairly normally, which didn't happen in some of the cases I've seen. My battery is infact in 'Replace Soon' condition, with 1200 cycles. I've posted a screenshot of CoconutBattery bellow. I've ruled out sending it to Apple, since they charge me 300€ because they have to replace the entire bottom frame. I'm thinking about ordering a battery from iFixit. Do you think this might fix my issue? Do I also need to replace the trackpad/keyboard cable? Any experience regarding similar situations is highly appreciated. I would remove the battery and rely on the power adapter. You can try resetting your SMC, this fixes a lot of hardware and power related issues. Not the answer you're looking for? Browse other questions tagged macbook keyboard battery mouse trackpad .